For Padre Pio, the events that set him on the path to sainthood began in September 1918. "After I had celebrated Mass, I yielded to a drowsiness similar to a sweet sleep," he wrote later to his spiritual advisor. While in this drowsy state, the 31-year-old Capuchin monk saw a "mysterious person" whose "hands, feet and side were dripping blood". "The sight terrified me and what I felt at that moment is indescribable," Padre Pio wrote. "I thought I should die and really should have died if the Lord had not intervened and strengthened my heart which was about to burst out of my chest. "The vision disappeared and I became aware that my hands, feet and side were dripping blood. "Imagine the agony I experienced and continue to experience almost every day. The heart wound bleeds continually, especially from Thursday evening until Saturday." Perhaps understandably, Padre Pio found the wounds "embarrassing", and prayed for the visible marks to be removed. But he did not ask for relief from the pain of the wounds, he wrote, "since I wish to be inebriated with pain". He believed that the wounds, which stayed with him 50 years, gave him the strength to fend off attacks by the devil. Padre Pio wrote that one night, "that wretch did nothing but beat me continually". "He presented to my mind many diabolical suggestions, thoughts of despair, distrust in God. But praise be to Jesus, for I defended myself by saying to him repeatedly: 'your wounds are my merit'. " Padre Pio's devotees says that from his childhood in an Italian peasant family, it was evident that Francesco Forgione - as he was originally called - was a special child of God. But it was the gift of the stigmata that began to attract attention to the padre, which grew into a cult following as more miracles came to be associated with him. He was said to emit an odour of sanctity, similar to that of roses or violets. Prophecy and miraculous cures were also attributed to him during his lifetime. Followers of the padre say that all evidence of the wounds disappeared several days before his death in 1968. A lifelong devotee of the Virgin Mary - he is said to have recited the rosary 35 times a day - Padre Pio died repeating the words "Jesus - Mary" over and over again. Many regard him as a saint already - especially in Italy - and his monastery in southern Italy receives over seven million visitors a year. Rosaries and holy water dishes with the padre's image can be purchased over the Internet. 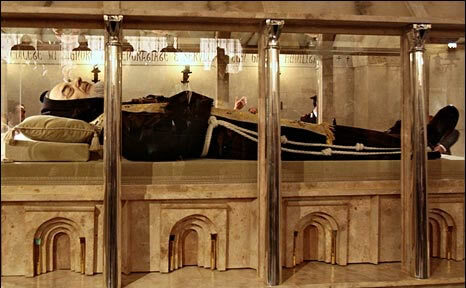 Past pontiffs have been suspicious of Padre Pio and his miraculous wounds. The Vatican even bugged the padre's confessional and opened his mail. He was also banned from saying Mass for many years. But the present Pope, who travelled from Poland to visit Padre Pio in 1947, has accepted him back into the church's fold and honoured him with the title "The Venerable". But beatification - an honour which usually leads eventually to sainthood - requires evidence that the candidate has been responsible for working miracles. For followers of Padre Pio, the good news came in 1991, when a woman who had been hospitalised for a burst lymph vessel made a rapid recovery after praying for the padre's intervention. After investigating the case at length, the Vatican declared the cure to be authentic and "extraordinary" - evidence enough to put Padre Pio on the path to sainthood.